short periods of swooning, or disconnection from the external world, usually at very high doses or during brief blasts of intense rushing while coming up. Some people are considerably more sensitive to MDMA than others. Those using MDMA for the first time or using material of an unknown purity and strength should be extremely careful. 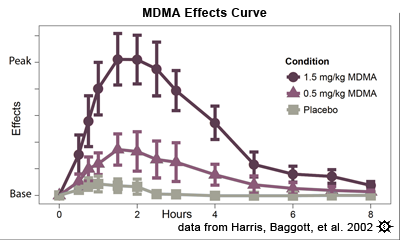 Based on research from multiple labs, the effects of MDMA can increase non-linearly with increases in dosage. That is, increasing dosage from 100mg to 120mg (a 20% increase in dosage) can cause more than a 20% increase in experiential effects level. See Harris DS, Baggott M, et al. 2002 and de la Torre R, Farre M, et al. 2000. The current theory is that some metabolic pathway becomes saturated/overwhelmed somewhere around 1.5mg/kg and above, resulting in higher plasma levels and effects levels. The specific metabolic reason for this non-linearity has not yet been proven. Erowid's effects information is a summary of data gathered from users, research, and other resources. This information is intended to describe the range of effects people report experiencing. Effects may vary dramatically from one person to another or one experience to another based on a variety of factors such as body chemistry, age, gender, physical health, dose, form of material, etc. Harris DS, Baggott M, Mendelson J, Mendelson JE, Jones RT. "Subjective and hormonal effects of 3,4-methylenedioxymethamphetamine (MDMA) in humans" Psychopharmacology (Berl). 2002;162:396-405. Vollenweider FX, Gamma A, Liechti M, Huber T. "Psychological and cardiovascular effects and short-term sequelae of MDMA ('ecstasy') in MDMA-naive healthy volunteers" Neuropsychopharmacology. 1998 Oct;19(4):241-51. Baggott MJ, Coyle JR, Siegrist JD, Garrison KJ, Galloway GP, Mendelson JE. "Effects of 3,4-methylenedioxymethamphetamine on socioemotional feelings, authenticity, and autobiographical disclosure in healthy volunteers in a controlled setting" J Psychopharmacol. 2016 Feb 19;.